A powerboat coming down the upper Bay from the C&D Canal became fully engulfed in flames Sunday morning, forcing everyone to jump overboard into the chilly November water. 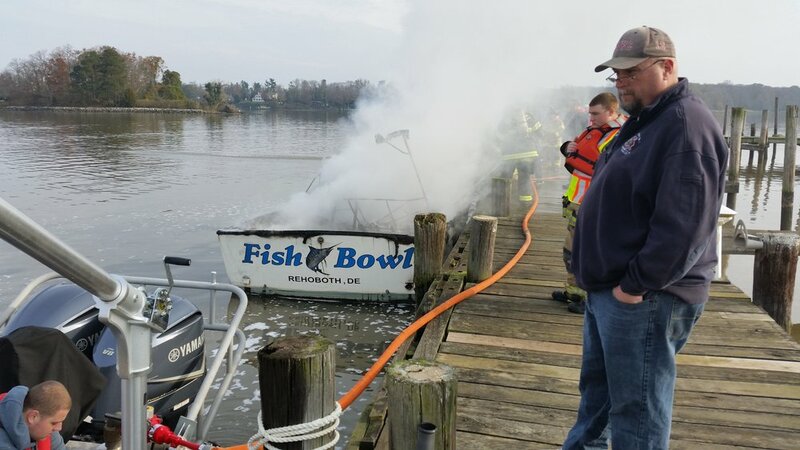 The boat, a 32-foot cabin cruiser called Fish Bowl was en route from Delaware City to a marina on the Chester River for winter storage when it caught fire. Maryland Natural Resources Police (NRP) tell Bay Bulletin that the fire started in the engine compartment and caused the temperature gauge to shoot up. The boat headed for Harbour North Marina on the Elk River to get help. According to the Charlestown Fire Company, five people on board all jumped into the water as the boat came into the marina’s docks. NRP says all five swam about 15 yards to shore, and all of them refused medical treatment. North East, Chesapeake City, and Hacks Point Fire Company all sent fire boats to the scene, along with Cecil County Emergency Services and the Maryland Department of Natural Resources. The state fire marshal is investigating the cause of this fire.